I almost can’t believe this day is finally here. Woo hoo! 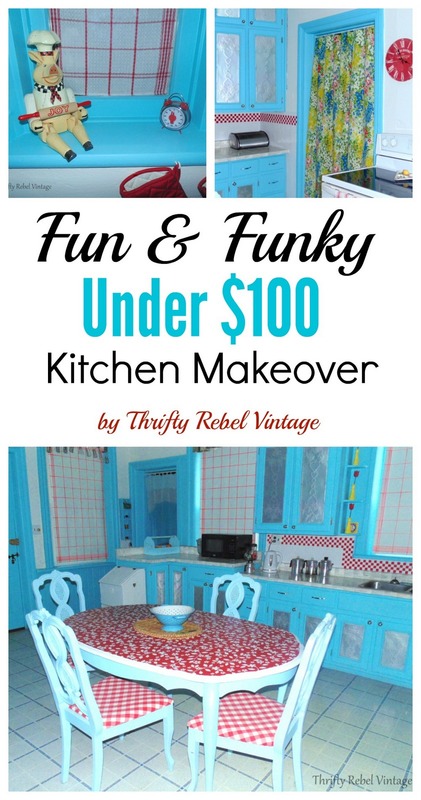 Today’s the day I get to share my under $100 kitchen makeover with you. 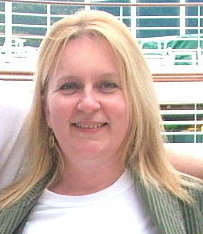 My blog tagline is ‘You can create a home that smiles by repurposing, reusing, and rethinking’. I certainly hope by the end of this post you’ll agree that it’s not only possible, but on a very low budget too. 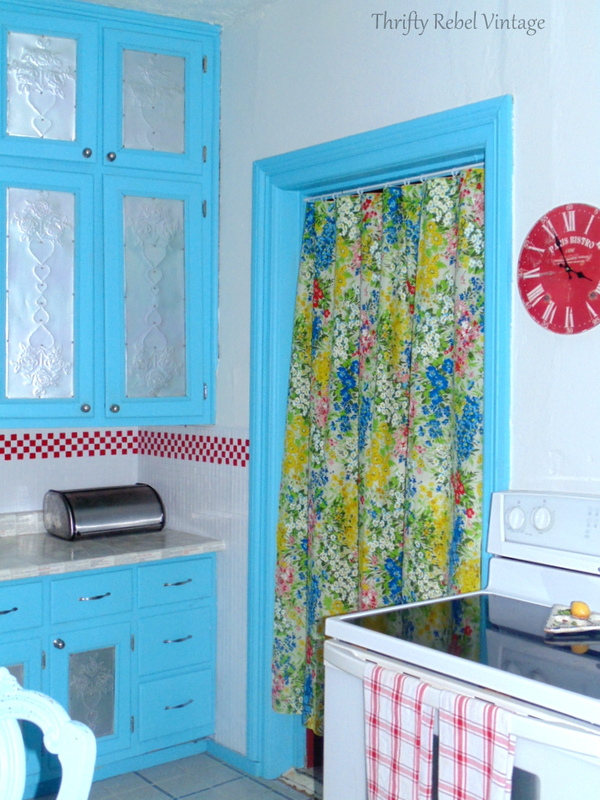 My goal with this makeover was to create a fun kitchen that makes us feel happy. Let’s face it, the outside world can be a crazy place and I really wanted us to have a bright and cheerful place that makes us smile… and even laugh. 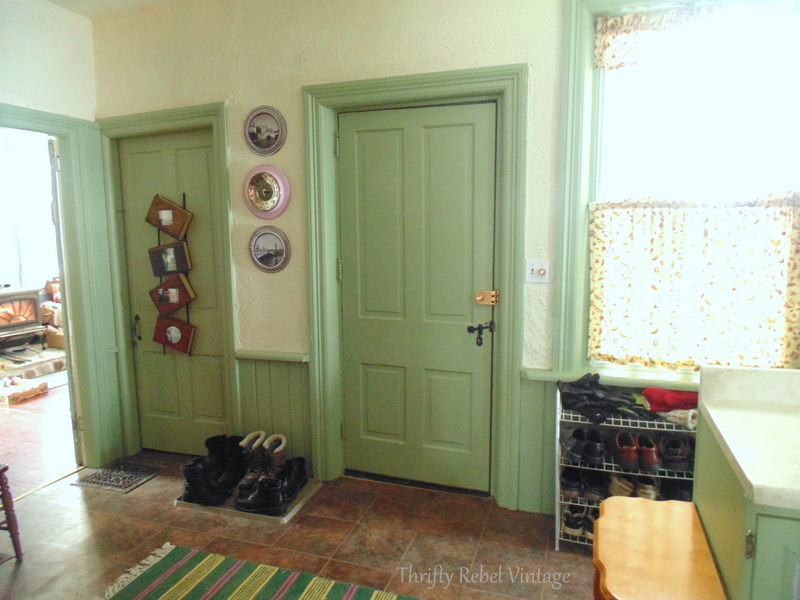 This kitchen makeover adventure started in January and, honestly, there were times when I thought I’d be on this road forever… especially during the summer when much of my time and attention had to go to the yard and gardens. Most of the big projects got done pretty quick. It tends to be the little details and fun decorative touches that take me some time, but when it comes to room makeovers the little things are just as important as the big ones. Pierre, my wooden pig chef kitchen mascot, and I are both overjoyed with the outcome. It’s cheap, it’s cheerful… and most importantly… it’s done! 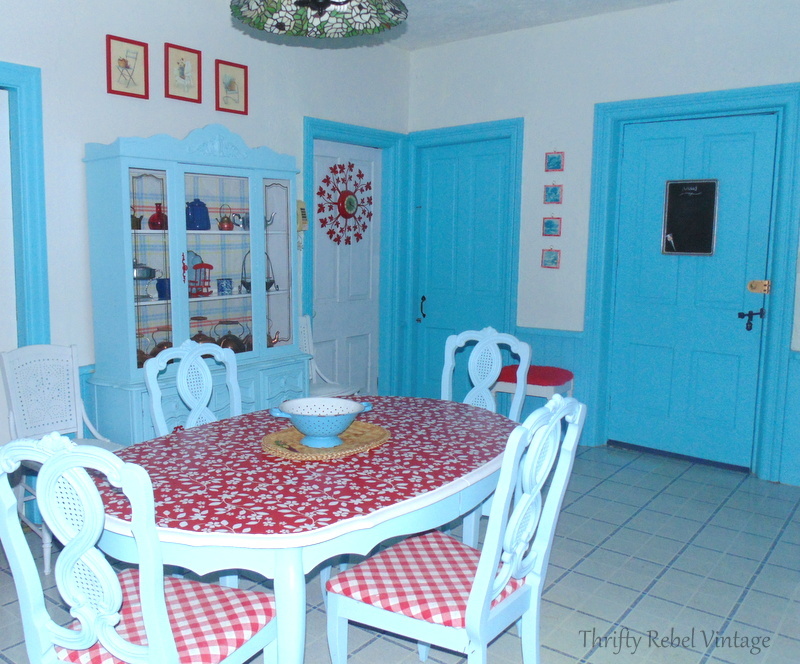 So… welcome to my aqua and red under $100 kitchen makeover. I’m so glad you’re here! There’s a lot to see so grab yourself a cup of something, have a seat, and let me show you around. I’m including links along the way so you can easily take some project side trips, but don’t forget to come back to the main tour. 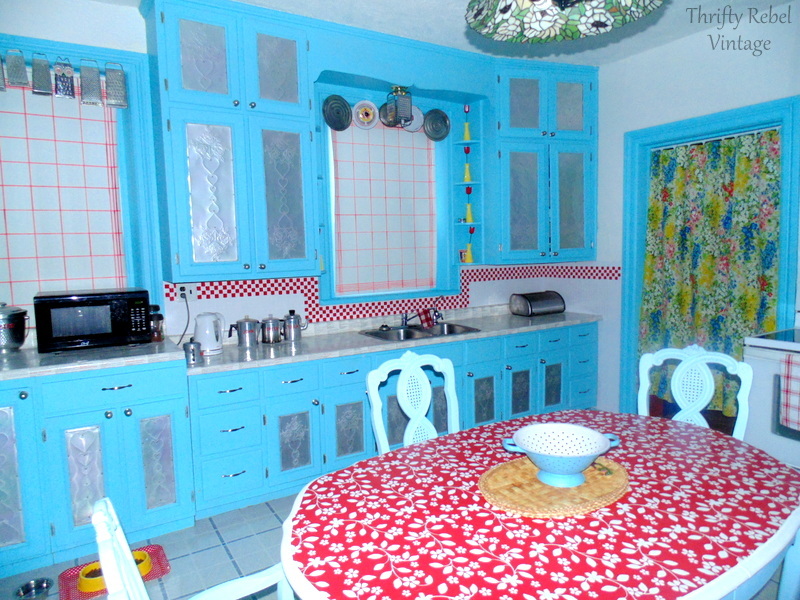 One of the first projects was painting the kitchen cupboards . Now I’m not going to lie… this is a huge job, but honestly I love to paint and I find it quite relaxing. When we moved into this house 19 years ago I knew I’d always be keeping these old cupboards. They just kinda do it for me. This is the third time I’ve repainted them, and hopefully it’ll be the last. But who am I kidding? lol. I also painted the ceiling and walls a creamy white. You’ll see in the before pics at the end of this post that they were a creamy yellow. If you’re like me, and need to decorate on a budget the easiest and least expensive way to make a huge difference is with paint. I made and added the punched tin panels myself about 15 years ago, and they will always be staying. 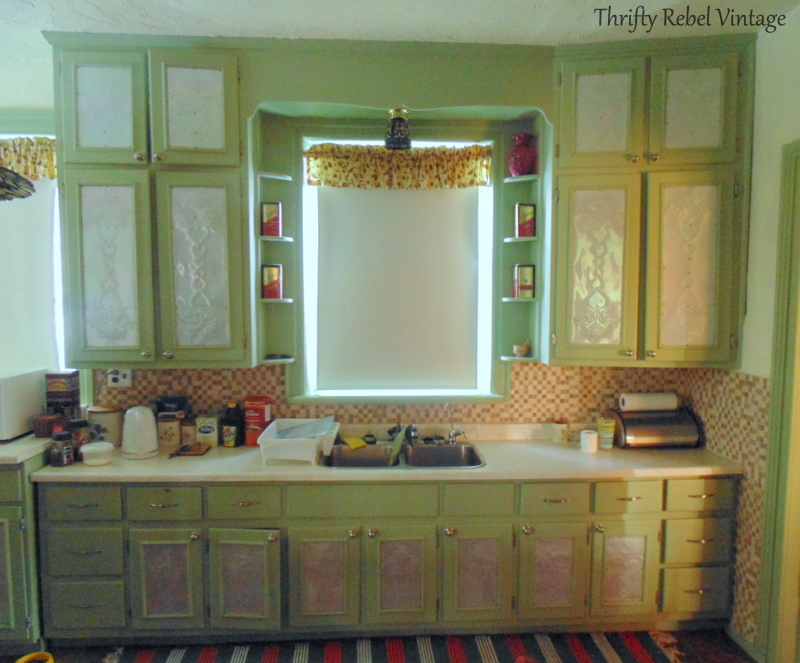 The electrical tape faux tile back splash was a fun and easy project that totally transformed the look of this main cupboard area. I’ve never cut so many squares in my life! I wanted some pops of yellow so the spray painted glass vases and tulips were an easy way to add that, and they help me make sense of those rather strange and clutter-attracting shelves. As long as they have these vases on them I won’t be able to fill them with other messy looking stuff. The faux redwork tool caddy fruit storage, was a fun makeover. I’ve always loved redwork embroidery. If you have any plain vinyl blinds, this faux tea towel blind makeover cost me nothing and makes a huge difference to the look of the windows. And the vintage egg beater window valance and grater window valance were just a way for me to display a collection and the graters that I use to make junk owl wind chimes. That sweet little bench was a garage sale find and it was already white so all it needed was a fun, fast, and funky bench seat makeover. I’m a vintage bakeware collector and the repurposed cookie sheet chalkboard was another quick and easy project. It’s a handy place for me to write down things that we need as I think of them so I don’t forget. So far it seems to be working. 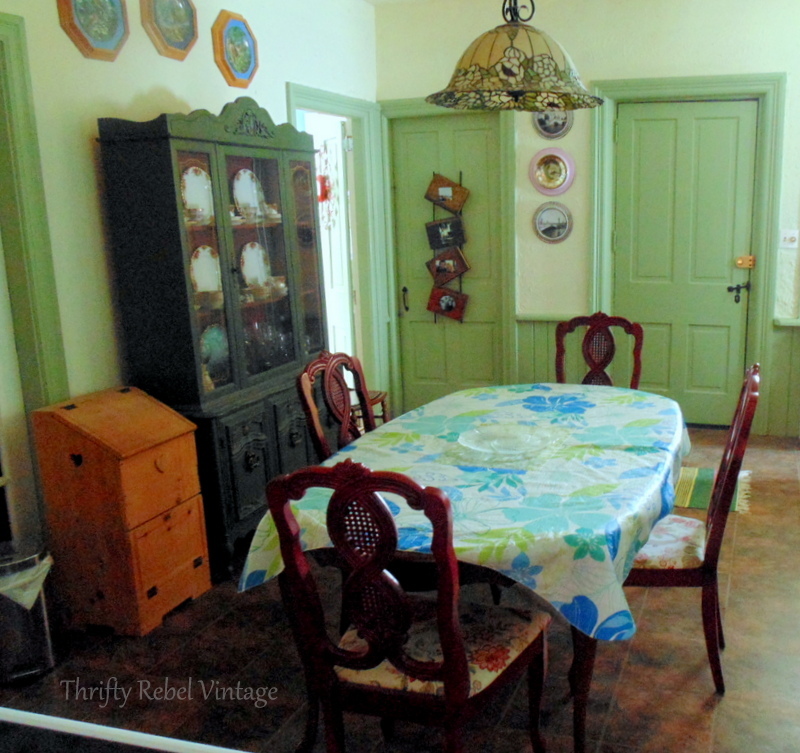 The sweet little country wall plaques and the chair pictures over the china cabinet got quick and easy frame makeovers. 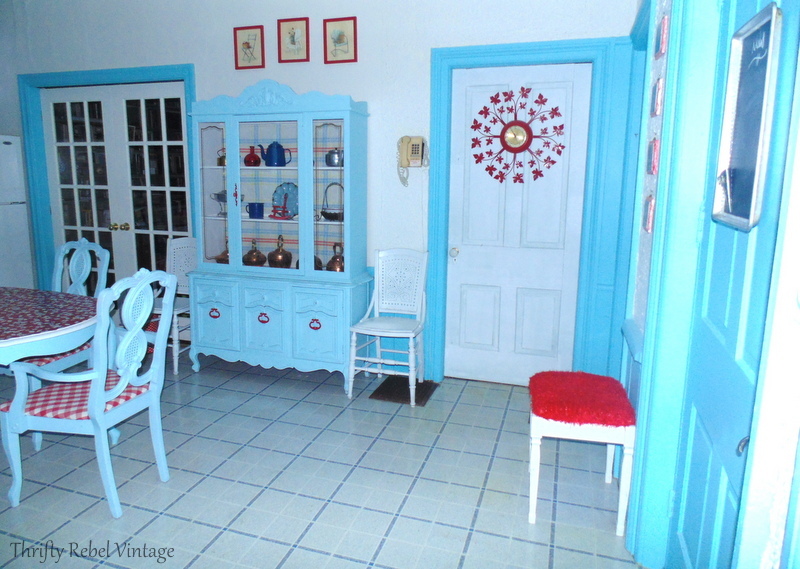 That vintage starburst clock makeover was done for the living room a few years ago. I just hung it on an existing nail, but I think it needs to be moved down a bit. I didn’t even notice that until I saw this pic. The clock does work, but I just display it for its cool factor. I really wanted the table and chairs to make a statement. 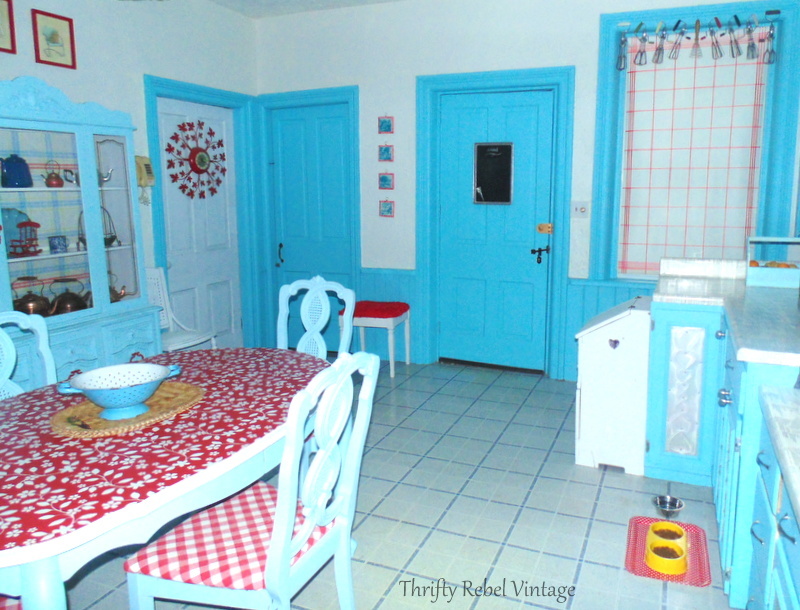 So I upped the fun factor with the tablecloth kitchen chairs makeover, and the decoupaged vinyl tablecloth table makeover. Now that was quite the experiment, and I’m very happy with how it turned out. I’m a polka dot loving girl so my decoupaged garbage can is perfect for me. I love sprinkling different patterns around a room. 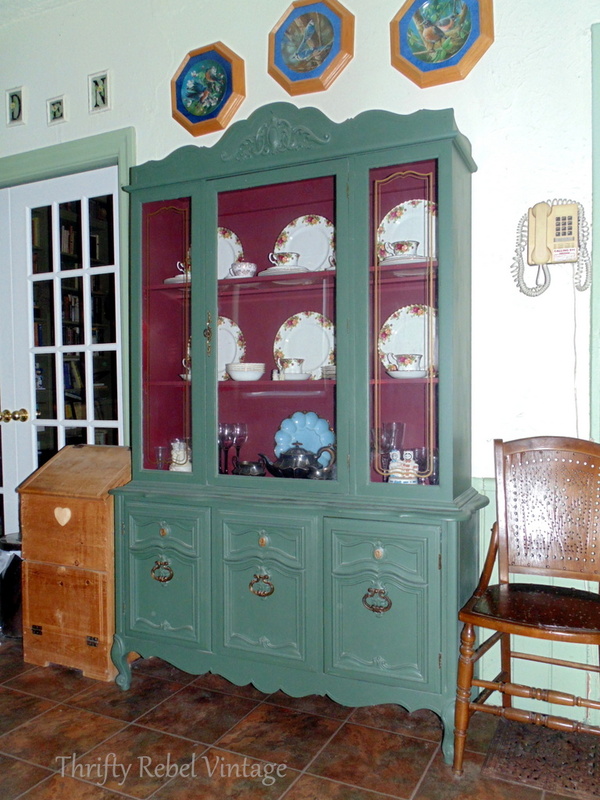 This china cabinet, which I’ve had for years along with the matching table and chairs, proved to be a bit of a challenge. 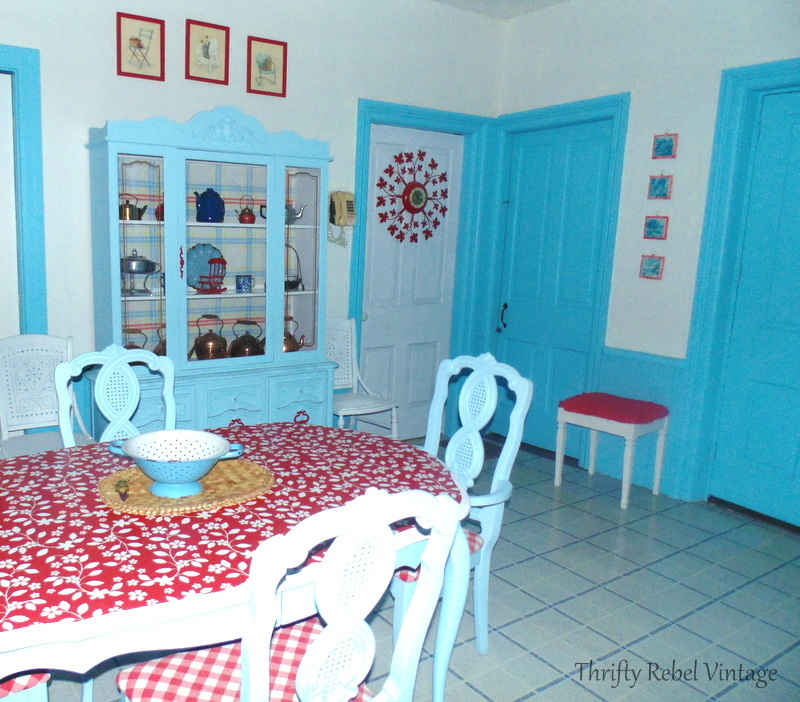 I totally shifted gears during the first china cabinet makeover, and then I tweaked that makeover with a quick and easy mini makeover of that makeover. 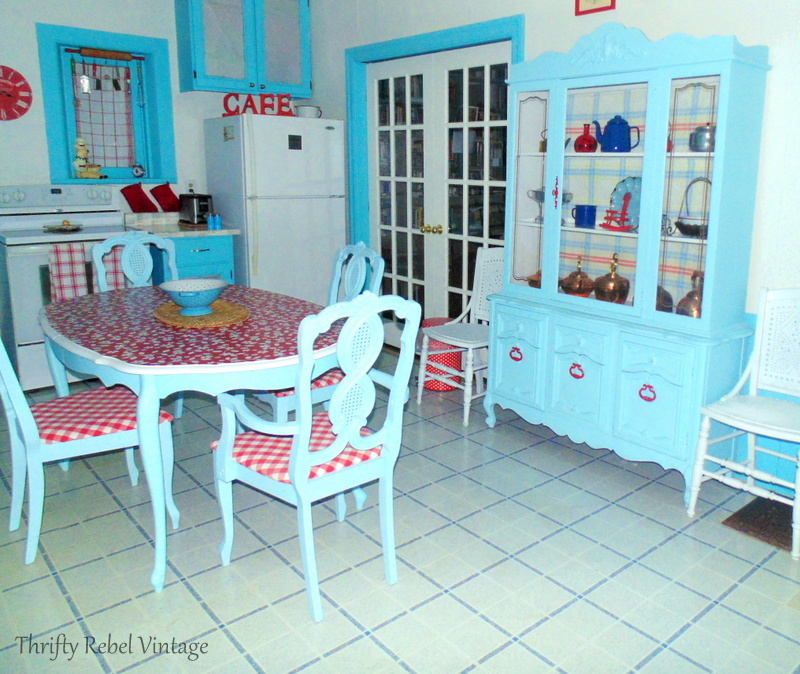 The two vintage wooden chairs on either side of the china cabinet were a great auction find from years ago. I gave them a quick makeover to freshen them up. 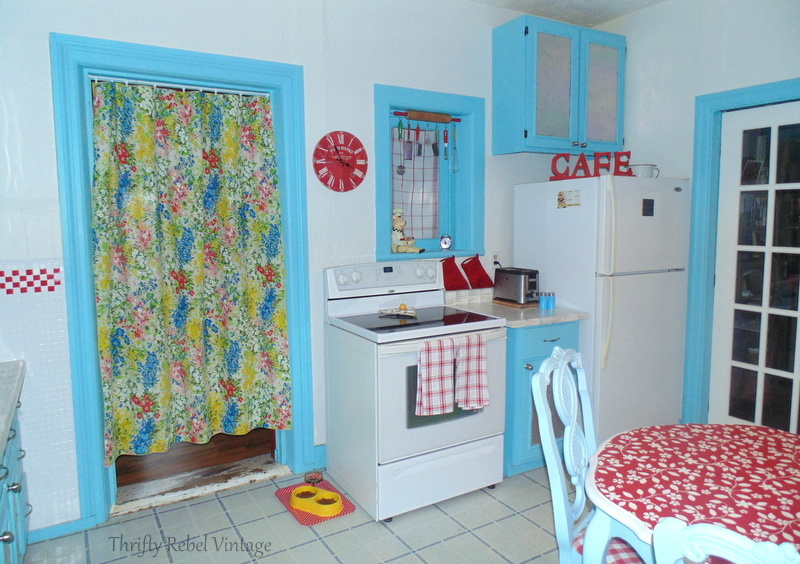 The repurposed rolling pin window valance was an easy way to hang some kitchen gadgets close to the cooking area, and it’s fun to look at. And I found the cafe sign a while back and just spray painted it red. It adds a much needed pop of colour on top of the fridge. The beautiful floral tablecloth is a recent thrift store find that I hung with a tension rod and clips that I already had. 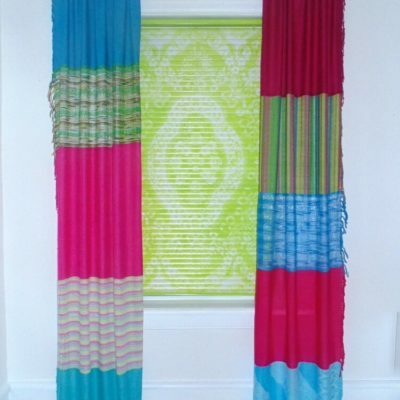 It makes a lovely door curtain between the kitchen and family room, and it can easily be pulled aside. 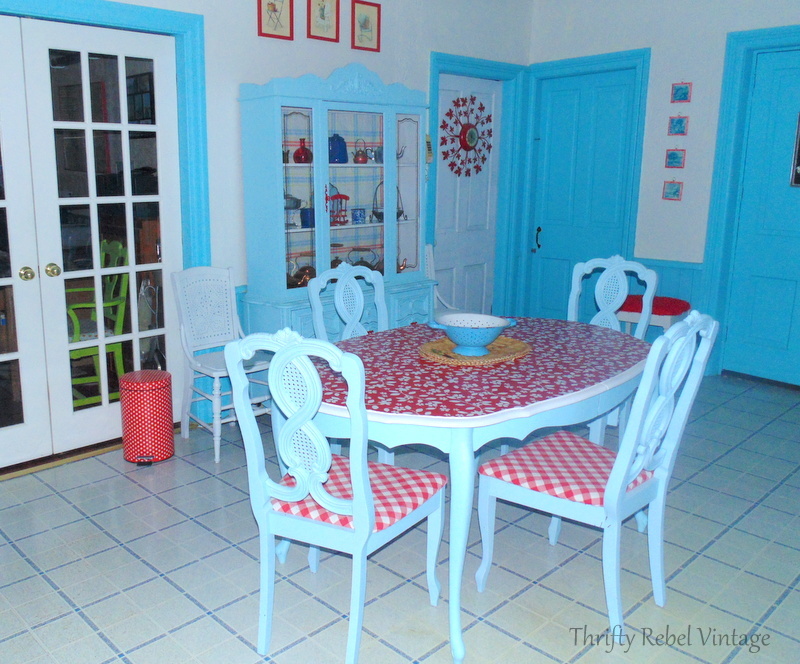 The family room needs a makeover at some point, and will be following in the kitchen’s fun and funky footsteps. 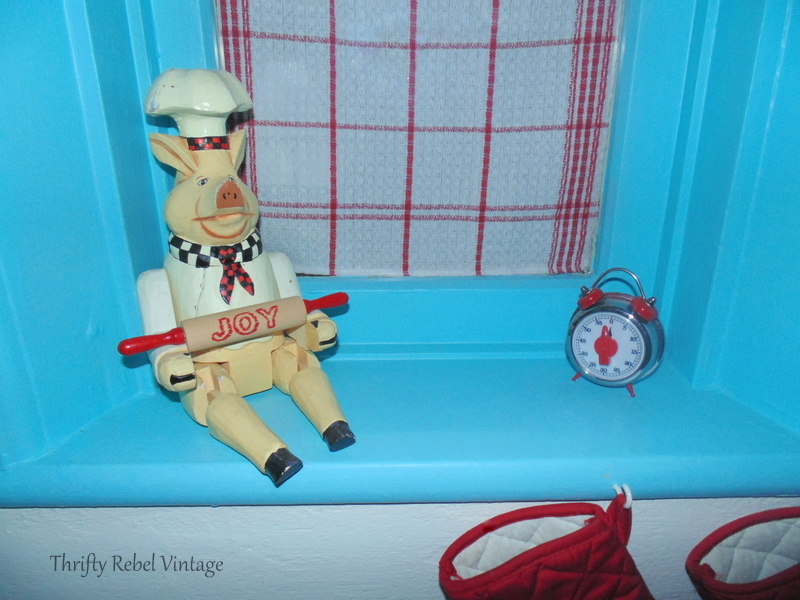 The red clock came from the living room, and I’ve had the vintage bread box for a few years. Some vintage coffee pots storage containers from my stashes replaced a ceramic set of canisters that had to go, and my graters kitchen light gives much more light to the room that the small fixture I had there before. I made a simple pot lid window valance with a few vintage lids from my collection. Thanks to my hubby John, who found the perfect recipe book, my decoupaged recipes kitchen counters are one of my favourite things ever. I originally thought they were going to be temporary, until I could afford new counters but… you know what? I’ve fallen completely in love with them, and they’re staying… maybe forever. The best thing about them is that if there’s ever some damage or a stain… I can just grab a recipe (I had tons left over) and some Mod Podge and cover it up. You’ll see in the before pictures below that the flooring used to be brown toned. I did a make-under by removing the vinyl plank floating floor to reveal this blue and white vinyl tile floor that John and I put down probably about 15 years ago. I wasn’t even sure of its condition, but I lucked out. It’s not perfect, but it really pulls the whole kitchen together. 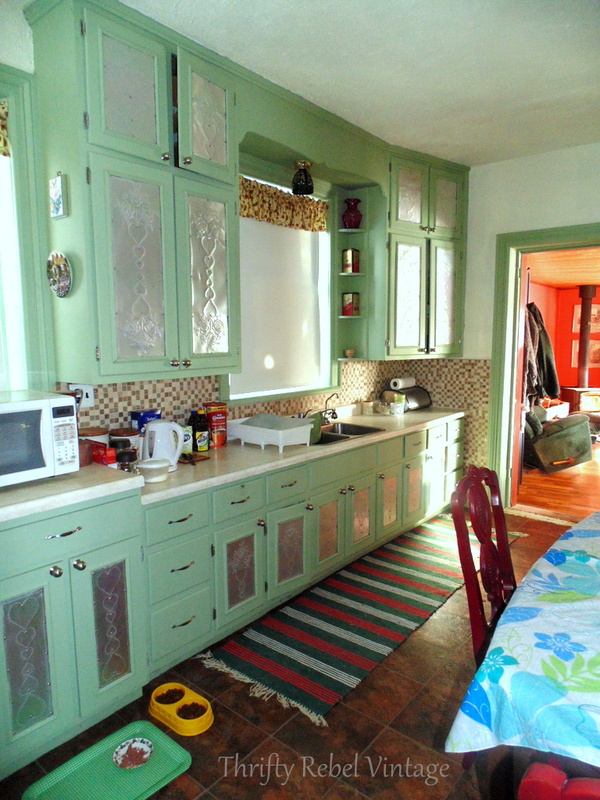 Here are some befores and afters of my under $100 kitchen makeover. I’ll probably be putting some rag rugs down for the winter. I have some that my mother made for me years ago. For now I kinda want to enjoy the floor au natural. It’s so light and bright! The kitchen light over the table and chairs will be staying for now. I have a repurposing project in mind to replace it, but I need one last piece. I’m patient and will happily wait until I find exactly what I’m looking for. So here’s my cost list for my Under $100 Kitchen Makeover. I’m only counting things that I purchased for this makeover. I’m not counting supplies or items that I already had that I used, reused, or repurposed in some way. For just $98.00, and a lot of hard but mostly fun work, I created a kitchen that makes us smile… and that’s what it’s all about for me. The kitchen door is the one we use all the time, and now when we come home from work each day it’s such a wonderful warm welcome. So bright and cheerful! So I hope I’ve convinced you that a complete room makeover is possible on a small budget. It’s all about working with what you have and figuring out how to make it better with some time, a little luck, a whole lot of patience, and an adventurous creative spirit. Oh, and a sense of humour helps a lot… because things can and will go wrong, and as evidenced by me things can and will be forgotten. lol. My kitchen isn’t perfect, but honestly it doesn’t have to be. Personality is what makes a room… not perfection. 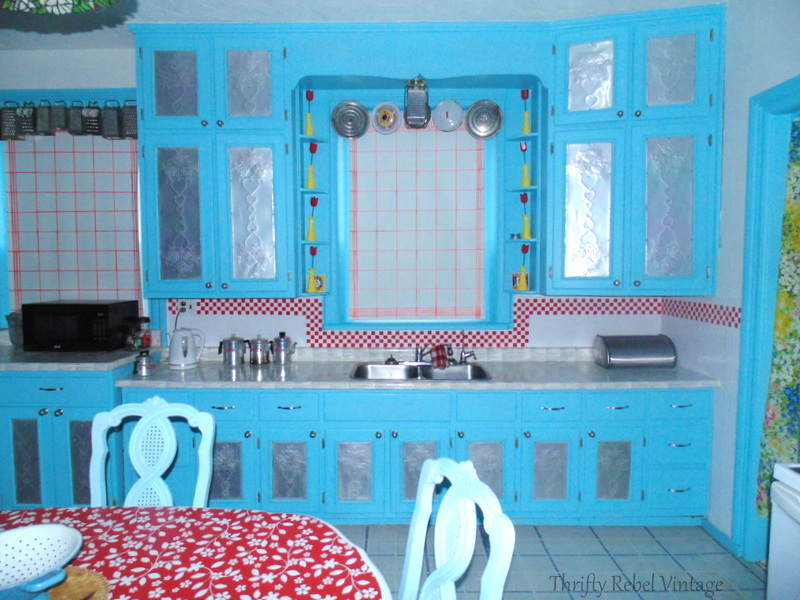 Anyone can create a room that smiles by repurposing, reusing, and rethinking. Just because we don’t have a lot of money to spend doesn’t mean we can’t decorate our homes in a way that brings us joy. There’s actually a sense of freedom that comes from having practically no budget to work with. That might sound strange, but it forces you to think differently… more creatively, it opens your mind and makes room for all kinds of crazy what-if ideas. I just wish it happened all the time. lol. Thanks so much Marci! I really believe we should get our collections of things out of boxes and closets and put out into the open when we can enjoy them every day. I’m so happy I was able to do that. Tuula, WOW! 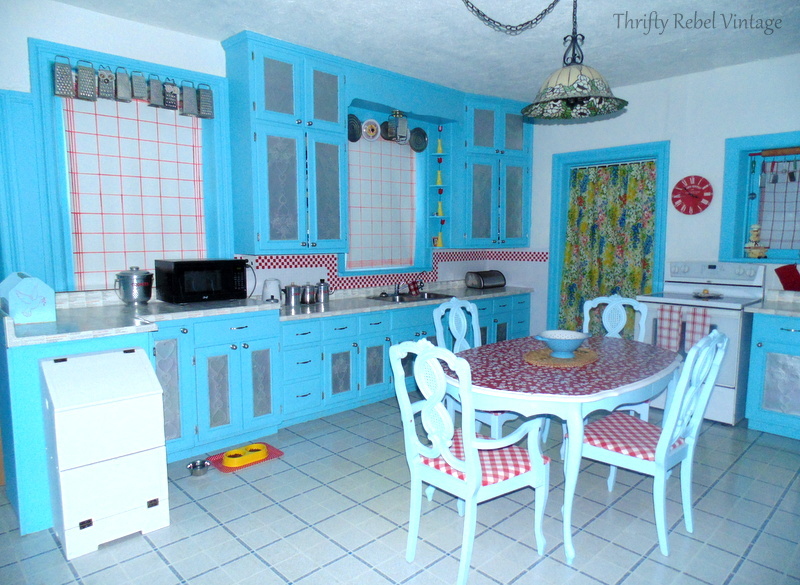 What a fun, funky, cheerful and thrifty makeover. Your kitchen is … sparklicious! Truly happy and just makes me smile. Thank you for sharing all your details!! Thanks Tania! I’m so glad I just went for it with the floor. I was very lucky on this one. That phone is mocking me. lol. It’s just calling out for some spray paint love. It was so fun to see this makeover all along the way with each project that you made. All together and done it is fabulous! I am an aqua/red girl so this speaks to me loud and clear. Great job!! Thanks very much AnnMarie! I’m pretty sure the aqua and red will be spreading to other rooms in the house, but not until after Christmas. I need a room makeover break. lol. secret wish. Cannot believe how you managed all that on so little cost. good when we give old things new purpose. Thank you!! ? Thanks so much Kathleen! I know you get how much work a room makeover can be, but it’s always worth it in the end. Now I can relax until after the holidays when the next makeover will start. Just have to decide which room it will be. Unfortunately I have a few to choose from. Decisions… decisions. You have completed and now have “your happy place” . So easy to smile when you walk into your cute kitchen. Great job. I would love tos ee some photos during the day, I think nighttime or ones with shades drawn make it look a bit neon…I loved watching this all happen! You must smile so big when you walk into thsi room every morning! Thanks so much Sandy! This room makes me smile every time I walk into it. The paint is quite bright, but that totally works for me. I literally took hundreds of pics at different times of the day with the blind up and down, and it took hours to go through them all. Pretty exhausting too. One of these days I’ll get a much better camera that can handle light coming in through windows. It’s always a problem that my current camera just doesn’t deal with very well. What a beautiful result! You have such a way with color and the things you find. Thank you so much Judi! I’m very happy to have a lighter and brighter kitchen, especially because of the cold and snowy winters that we have here. Thanks so much Dona! I’m so glad I can call it done and now I can just enjoy it. Tula great job it looks so bright fresh and pretty. Well done on the budget certainly worth a year of work. Thanks so much Mel! Working on an almost nothing budget does makes room makeovers take what seems like forever, but it’s very rewarding when it’s all done. There were so many things in the kitchen that needed doing. I don’t think the next rooms I do will be this complicated. At least I hope not. lol. 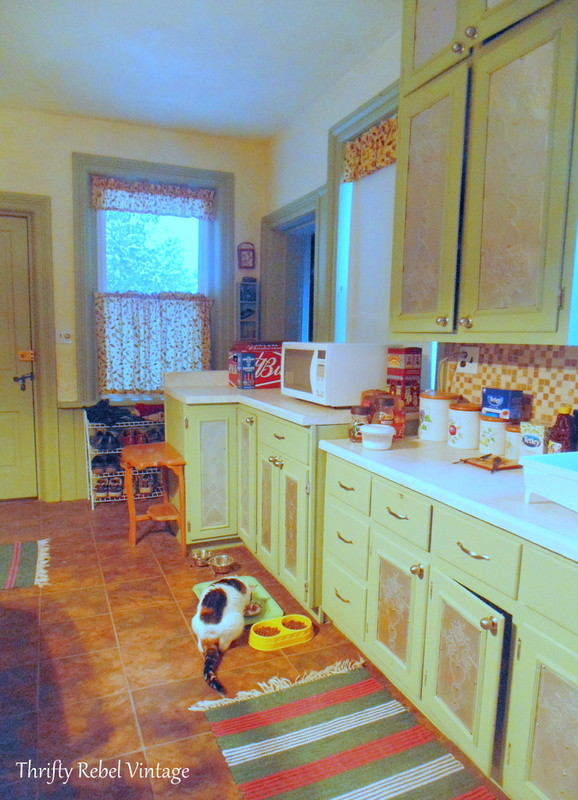 Tuula, I’ve really enjoyed watching the transformation of your kitchen. It looks so cheerful & Pierre is fabulous! 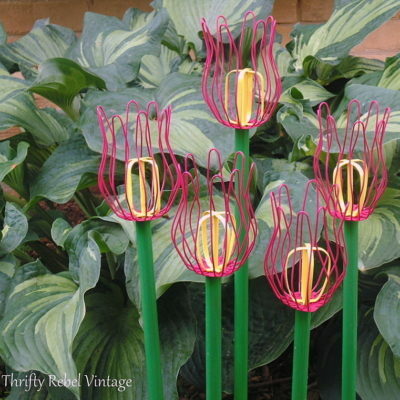 Thank you for sharing at Vintage Charm–pinned! Thanks very much for sharing Cecilia! I hadn’t seen this yet. Where have I been? This looks great Tuula! OK, so I wasn’t a fan of the bright aqua and red at first, but in comparing to your before picks, it’s a great improvement; it’s fun, and I can see how it makes you smile. I see a lot of things I like. I hadn’t seen your floor before, and it looks so nice now. Love all the fun valances, and you pointed out how you can just add more recipes to your counters if they get messed up. That’s a huge plus. I’m really liking it. Thanks so much Florence! 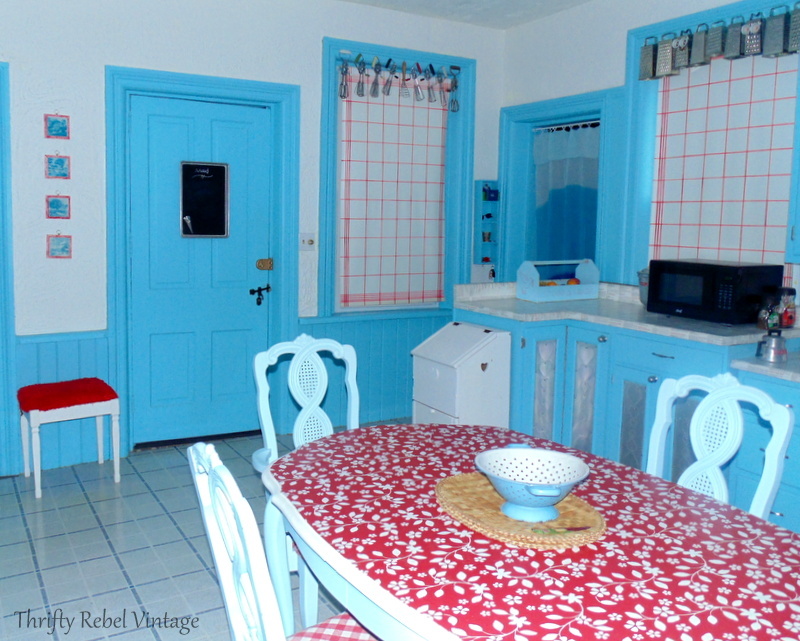 I know aqua and red aren’t for everyone, but they’re definitely for me… and my kitchen definitely makes me smile. Especially right now when it’s -15 outside. lol. Tuula what a stunning kitchen makeover. And you have done it all with practically no budget. 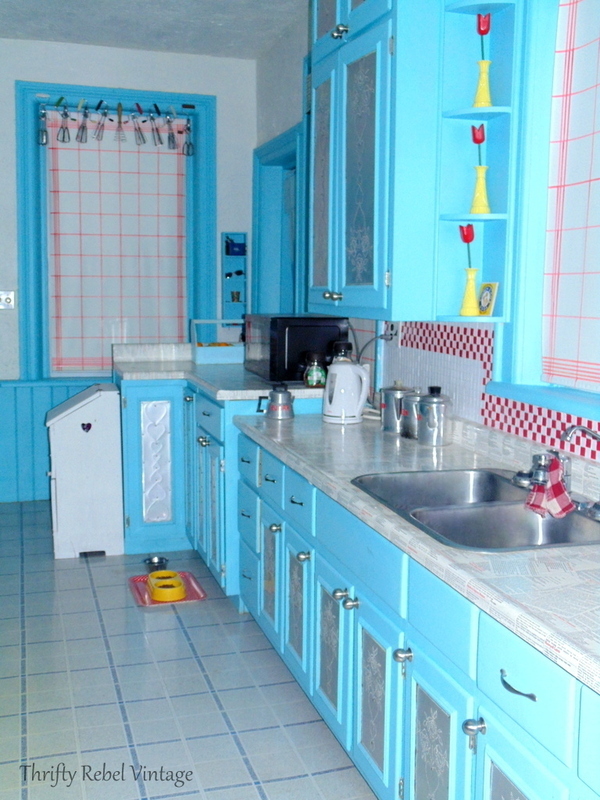 I bet it must make you smile when you walk into that pretty blue kitchen. Thanks Mary! It really does make me smile, especially because it cost me so little. A lot of elbow grease though, but I’m always willing to spend that. 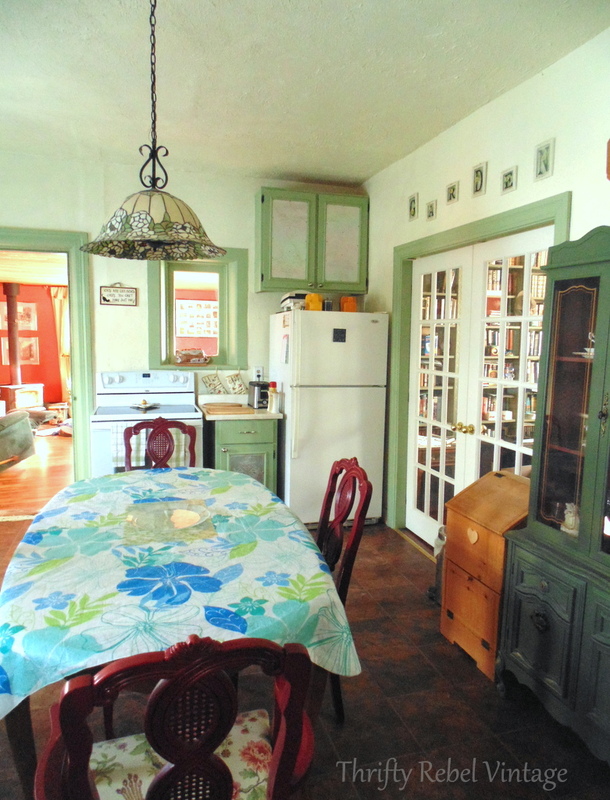 I’m so glad I got to see before and after pictures; I liked a lot of components of the before kitchen and the after one, too. That blue is definitely a more upbeat color and I love the “new” floor. Makes me think about some DIy-ing for my own kitchen. I feel like I “know” you a bit better being invited into your home! Thanks Kathy! 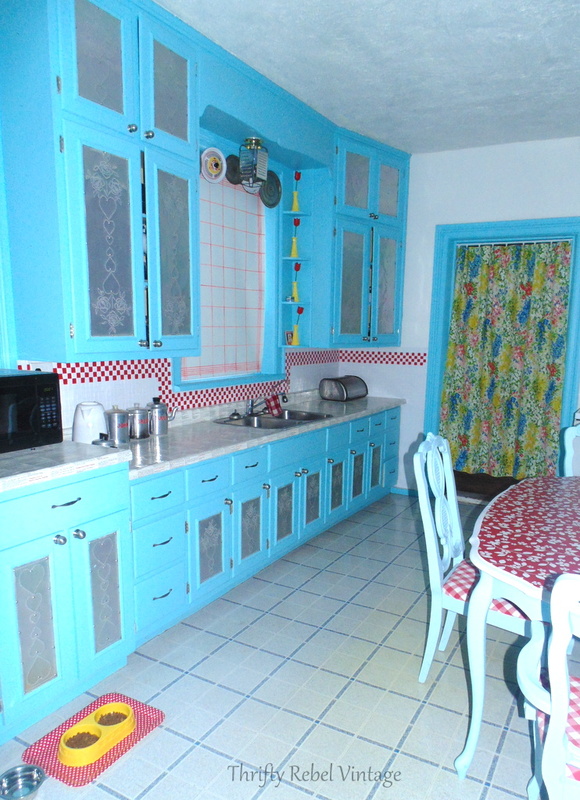 The sage green kitchen was me when I did it 15 years ago, but the new aqua and red is definitely more me now. As I’m getting older I’m feeling the need to brighten things up with fun colours that are happy and cheerful. Every day when I come home from work and I enter my kitchen it makes me smile, and for me that’s what it’s all about. It’s amazing what a bit of money and a whole lot a elbow grease can do.